HIgh-Stakes Testing has to STOP! You know that high-stakes testing is no longer about what is best for children when a New York teacher walks into the children's ward of a hospital with the hopes of testing a fourth grader suffering from seizures. Joey Furlong is a 4th grader in the Bethlehem School District. He has life-threatening epilepsy and his seizures can only be stopped with medication so his parents are considering brain surgery. In order to get to that point though, Joey needs to go through a series of tests which is what he is doing right now at the Cohen Children’s Medical Center on Long Island. Thursday morning a woman walked into his room with a piece of paper that had his name on it and told my husband that she was a teacher from the New York City School District and that she was there to administer the 4th grade New York State test to my son,” Furlong tells CBS6. The family was shocked. This is outrageous and these are the people who want to set the standards for education? We don't need Common Core in education we need a little more common sense! This has to stop. Parents and educators you don't have to be held hostage to high-stakes tests in the classroom or a hospital room. It's time to protest the nonsense! Parents and students are getting angry and getting the attention of state school officials. “We were not going to sit around and see our kids be potentially put at a competitive disadvantage,” said Dineen Majcher, whose daughter is in the first class affected by the new testing. Hundreds of Chicago students are taking up the mantle in the fight against the role of standardized tests in public school closures as they walked out of a state exam Wednesday. Their message: "We are over-tested, under-resourced and fed up!" Common Core and high-stakes testing cannot stand up to scrutiny so proponents typically resort to character assassination to deflect attention away from bad policy. But there is power when parents and students on the left an right band together and say, "Enough!" 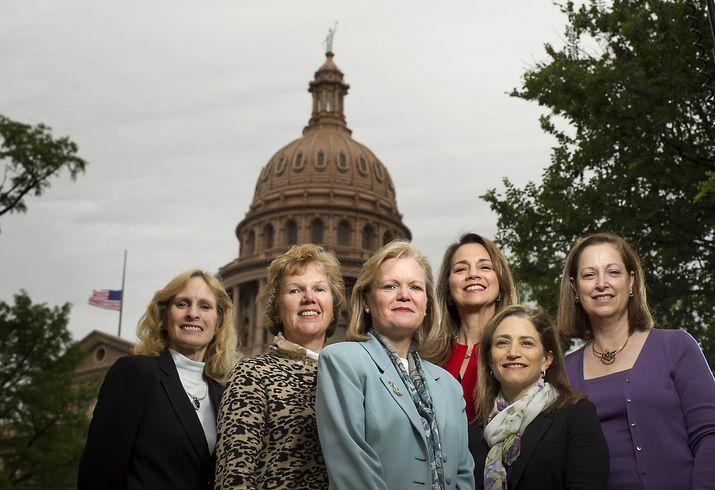 “You tend to think you’re just an island on an issue until you meet up with another island and before you know it, you’re a continent,” said Susan Kellner, a former school board president in Spring Branch near Houston who has become a leader of the parent group. After David Coleman left his post commanding Common Core through 45 states, he took a new position as the President of the College Board. College Board controls the SAT and Advanced Placement (AP). When Coleman took the position in the spring of 2012 he said in an interview with the New York Times, "The College Board should consider any student in an AP class a student in our care.” Clearly, Coleman has plans for the AP and students who take the exams. Since that time, AP announced a redesign. Trevor Packer, senior vice president of College Board, discusses how the Common Core standards will influence Advanced Placement curriculum. "Well we are really excited that the Common Core standards asks teachers to do a few things very well. And we've been making similar changes in AP through a parallel process - the redesign of AP science and history courses; that do the same thing. They ask teachers to concentrate on a smaller amount of content in much greater depth with a focus on skills that are going to last into college and careers." Homeschool parents of children in high school often seek out coursework that uses the AP distinction because it is widely perceived as a symbol for excellence in education. Homeschool Legal Defense Association (HSLDA) offers its members a discount to the Patrick Henry College Preparatory Academy that advertises the AP distinction. "Each course meets the College Board’s rigorous requirements for an official AP designation, fully preparing students for the related AP exam." The Patrick Henry FAQ explains how a course earns the AP designation? Before an AP course is offered by a school, it must go through—and pass—a course audit. When you see “AP” in a course’s name, you know that the course conforms to a college-level curriculum standard. All PHC Prep Academy courses pass the AP course audit before they are taught to students. Parents, beware! Either a homeschooling parent will have taught any given subject with such a different focus that the student will have difficulty in taking the test, or the parent will find herself "teaching to the test" and depriving her child of the balanced information that is one of the hallmarks of a home-school education. HSLDA disagrees and says that you can still use AP with a Christian worldview. However, that was written in 2011 before David Coleman became President or their pending AP redesign. College Board requires all AP teachers to submit a new syllabus and audit form based on the new requirements. Will College Board continue to approve syllabi that fails to align to Common Core, Next Generation Science Standards, or the C3 Social Studies Standards? Is it wise for a Christian to continue to seek their approval and validate the College Board/Coleman Standard of "excellence"? As a Christian homeschooler, I reject the notion that we submit our coursework to any board for approval, especially one under the direction of David Coleman and his affection for the UN and global education. I don't mind losing the AP distinction if it means we remain free of secular influence in our education. AP and the College Board do not validate my children or their education. Student data-tracking, an essential component of P-20 education reform, is getting lots of attention and much needed scrutiny. Along with the obvious privacy concerns many wonder how the large amount of information or "big data", will be used. As always, it is helpful to remember the goal of public education: cradle-to-career tracking and placement to meet the needs of employers in the global economy. That includes exposing students to careers at an early age, starting with more elementary school tours of businesses. It also includes more coordination between schools and employers to make curriculum less theoretical and more practical. Michigan Governor recently said, "One of the key reasons we have an education system is to better connect kids and people to careers,” That's what they mean when they "college and career" readiness standards or "School-to-Work" as it was formerly known. And that's where the data tracking comes in real handy to education reforms. With the advances in technology and data collection for job placement has now been elevated to a science, Work-force science. Work-force science, in short, is what happens when Big Data meets H.R. Today, every e-mail, instant message, phone call, line of written code and mouse-click leaves a digital signal. These patterns can now be inexpensively collected and mined for insights into how people work and communicate, potentially opening doors to more efficiency and innovation within companies. Several start-up companies, such as Gild, are developing systems that crunch big data ins search of employees. Dr. Ming, Chief Scientist at Gild, explains how big data helps recruit computer programmers All the calculations lead to a "Gild score' a measure of what the person can do." Facebook, Amazon, Google, and Wal-Mart are either testing or using their service in search of employees.
" ...made available to state and local policymakers and residents of this state in the most useful format possible. Private student data collected and crunched creates a powerful tool to guide government/industry partnerships in work-force development in the 21st Century. The big data is not just GPA and ACT scores but other "noncognitive" fatctors such as "grit". "There is a growing movement to explore the potential of the “noncognitive” factors—attributes, dispositions, social skills, attitudes, and intrapersonal resources, independent of intellectual ability—that high-achieving individuals draw upon to accomplish success, (pg. v). Work-force Science: where social engineering meets big data for work-force development that will meet the demands of the state but not the dreams of the child. Education is NOT about training workers. The bible instructs parents to train up a child in the way he should go for eternity NOT to train a worker for the global economy in the 21st Century. As parents become educated about Common Core a common question is "What About College?" As national standards unfold there is still much that could change but it is helpful to remember that the ultimate goal is a "seamless pathway" from cradle to career. That means potential "stopping points" traditionally experienced would be smoothed into one continuous path, that includes the most obvious break between high school and college or work. I've already written about the testing aspect and the possibility of a merger between ACT and SAT but one aspect that I have only loosely covered is the application process into . There are a few breaks in the pathway that must streamlined to make this "seamless." I'll highlight two of them here: the high school transcript and a common application. Michigan has plans to offer an e-transcript through Parchment. "This service facilitates the electronic exchange of transcripts and other admissions documents for all Michigan public and private high schools and colleges. Transcripts and documents are sent through Parchment in a manner compliant with the Family Educational Rights and Privacy Act (FERPA). In the words of Parchment e-transcripts are "Putting the Train on the Tracks." For many students their next destination is college. An e-transcript is useful for online college applications. But the process is getting even easier. If you go to a college that is a member of The Common Application consortia they'll do it for you. The non-profit group The Common Application, Inc. created the Common App. It is designed to " to provide a common, standardized first-year application form for use at any member institution. " The Common App began in 1975 with 15 institutions and now has more than 400 member institutions. In 2007, they announced the "Next generation Common App Online System" and in 2011 accepted their first international institution. Common App uses a "holistic approach" to the admission process. A holistic process includes subjective as well as objective criteria, including at least one recommendation form, at least one untimed essay, and broader campus diversity considerations. The vast majority of colleges and universities in the US use only objective criteria – grades and test scores – and therefore are not eligible to join. If a college or university is not listed on this website, they are not members of the consortium. Sending the Common Application to non-members is prohibited. A college may still have their own application but as a member of the Common App they are required to give equal consideration to applicants using either form. According to their website, "Many of our members use the Common Application as their only undergraduate admission application." A criticism of the Common App is that it eliminated the "topic of your choice" and that it's 500 word essay limit imposed through the use of a comment box, are stifling originality of thought and creating a homogenized student body. What? Common standards destroys originality and promotes conformity, who knew?!? Another growing controversy is whether an applicant should declare their sexual orientation. Some colleges would like to see it but for now Common App rejected the optional question. That's the problem with educational standards, they are not common. The Common App may revisit the issue. In the mean time, Common App is getting a make over. The "next generation common application" CA4 is set to launch in August of 2013 to handle the expected growth in use over the next decade. According to the New York Times, "teachers, counselors and school administrators are expected to submit 10 million transcripts, recommendations and other school forms through the Common Application’s electronic pipeline this year." College Board is encouraging students to take advantage of the Common App. They recently hosted Scott Anderson, Director of Outreach for The Common App, at their spring conference on Common Core and "to explore the impact the Common Core Requirements will have on undergraduate admissions, financial aid and other aspects of the enrollment management processes in higher education institutions." Should college admission standards be "common" and decided by one non-profit organization? Add in the data base that stores an amazing amount of student data and you have severe power and privacy concerns. Some might even call it a monopoly in college admissions. It is and at the same time just another hurdle smoothed over in the quest for a national P-20 educational system and a seamless pathway from cradle to career. What is a democratic republic? Today, Shane Vander Hart at American Principles Project posted a copy of the the new C3 social studies standards. He skimmed and found several places for concern and encouraged readers to read the text. So I did. In the College, Career, and Civil Life (C3) Framework for Social Studies Standards the call for students to become more prepared for the challenges of college and career is united with a third element: a preparation for civic life. Advocates of citizenship education cross the political spectrum, but they are bound by a common belief that our democratic republic will not sustain unless students are aware of their changing cultural and physical environments; know the past; read,write, and think deeply; and act in ways that promote the common good. There will always be differing perspectives on these objectives. The goal of knowledgeable, thinking, and active citizens, however is universal. Democratic republic? The term confused me. I knew the term Democratic, as in Democratic Party. I knew the term, republic, as a form of government. But I had never put the terms together. My mind instantly went to the famous quote by Benjamin Franklin when someone asked him at the close of the Constitutional Convention what form of government do we have - a republic or a monarchy? He replied, "A republic if you can keep it." "A democratic republic is a country that is both a republic and a democracy. It is one where ultimate authority and power is derived from the citizens. However, in practice countries that describe themselves as democratic republics do not always hold free or fair elections." No much better and probably a little worse. So I typed in "democratic republic United States" again expecting a long list of sources to help me out and received no help at all. I gave up and scrolled the standards to find a definition. I landed in the Civics section on pg. 29 hoping from some clarity and maybe even a definition. I didn't get either one. "In a constitutional democracy productive civic engagement requires knowledge of the history, principles and foundations of our American democracy. So is the United States a democratic republic, a constitutional democracy, or a democracy? Ben Franklin called it a Republic, can't we just keep it? Bless her heart, Barbara Bush was asked if her son Jeb Bush should run for President and she bluntly said no, "We've had enough Bushes." But Mom Bush isn't the only mom in America that thinks he shouldn't seek the nomination. Moms across America are not happy with Jeb Bush and his education policies, specifically his support of Common Core. Common core is causing a rift in the GOP and it's in large part because mothers across the nation are getting informed about the massive federal take-over of education and blogging, tweeting, and getting active in their states to oppose it. A recent Twitter rally, was able to get #StopCommonCore to trend globally. It was a one day event that made a huge impact. #StopCommonCore is now trending in many state legislatures and with mothers across the nation. Moms are getting active in their capitals and bills are being introduced and approved that halt Common Core in their states. (See TruthinAmericanEducation for what's happening in specific states.) Stop Common Core Facebook pages are active and growing in number as moms search for ways to network and share ideas. Parents and Educators of across the political spectrum are uniting. Common Core may have won the approval of 45 states in 2010 but it is losing the approval of moms across America in 2013. Jeb Bush is one of the biggest GOP cheerleaders of Common Core and moms know it. Bush's recent praise of David Coleman, chief architect of the Common Core spread like wildfire among moms and strengthened our resolve against him and the Common Core. Can Jeb Bush win in 2016 if he doesn't have the support of his mom? Sure. Can Jeb Bush win in 2016 if he doesn't have the support of moms across America? Not a chance. Home-schoolers and religious families that reject traditional government education would be tracked. Original NEDM data points included hair color, eye color, weight, blood types and even dental status. But if you click on the link today, it is gone. Gone. Gone. Specify the content and structure of logical and physical data models. The information in this conceptual model takes into account the processes associated with teaching, learning, and the business operations of education organizations. The model focuses on granular information at the school and LEA level rather than upon aggregate statistics or indicators for accountability. However, the model includes information that is necessary to produce aggregate and other types of statistics. The education data model can be used by educators, vendors, and researchers to understand the information required for teaching, learning, and administrative systems. Info but a link to no where. So where's the missing link to NEDM? Good news from Michigan today. House approves budget to halt implementation of Common Core. The MI Senate is still considering the measure, so keep the pressure on our Senators. LANSING, MI - The Michigan House today approved the Department of Education budget with an amendment which does not allow them to implement Common Core State Standards or "Smarter Balanced Assessments". Sponsored by State Rep. Tom McMillin, the amendment is similar to House Bill 4276 which is currently before the House Education Committee. Common Core State Standards were never approved by a Michigan Legislature. Concerns have been raised about the State Board of Education exceeding its authority as it attempts to implement standards in Michigan schools that were created by a private, national organization, the National Governor's Association. The National Governor's Association controls the content of the Common Core State Standards, and the privately-owned "Smarter Balanced Assessments" align with those standards. "The Department of Education is trying to put Michigan schools in Common Core without legislative approval," said McMillin, R-Rochester Hills. "Giving our authority to control what is taught in our schools to any national entity is wrong. I am glad the House is taking up the debate of whether this is appropriate." National education experts also weighed in on the budget amendment. Sandra Stotsky served on Common Core's Validation Committee from 2009-2010 and now advocates against the standards. "Michigan can have a brighter future if its own mathematics, science, engineering and literary experts at its great universities are asked to work out college-ready standards for Michigan high schools," said Stotsky, Professor of Education Reform at the University of Arkansas. She holds the 21st Century Chair in Teacher Quality. "Today's smart move by the House gives Michigan the opportunity to work out a range of state-based high school curriculum options." The budget will go to the Senate for consideration. State Rep. Tom McMillin is a third-term lawmaker representing the 45th House District. The 45th District includes Rochester, Rochester Hills, and part of Oakland Township. McMillin can be reached toll-free at (866) 969-0450, via email at TomMcMillin@house.mi.gov or on his website need website at www.gophouse.com/McMillin.htm. For additional updates follow House Republicans on Facebook and Twitter. I just finished speaking to another aide in your office regarding Common Core. I asked him to please inform me regarding your position on Common Core (adopted in 2010), Next Generation Science Standards (pending adoption on May 14), and related assessments currently being piloted in Michigan schools. Predictably, I didn't get an answer. I never do. On different calls, I've been told you don't comment on bills that are still in committee (HB 4276), that this is something handled by the State School Board and out of your jurisdiction, or that this was decided by the previous administration and you don't have a position. This morning, I was simply and politely told that my concerns would be passed along. I'm tired of waiting. No comment is no longer an option. These standards are being implemented under your leadership, yet we don't know whether you think they are a good idea for Michigan. Where is your "tough nerd" analysis? "So I'm actually going to take that concept and go talk to the state superintendent to say, 'Why don't we make that more official.' Go to the state superintendent, the state board to say, 'Hey, if that's a good enough idea, we should be talking about doing that in schools." You are GOING to the school board to try and make Skunk Works more official but you refuse to comment on Common Core and Next Generation Science standards? When I asked your aide about the apparent inconsistency and your willingness to comment on the concept of Skunk Works but not the concept of Next Generation Science Standards scheduled to be adopted by the State School Board on May 14, he said it was because you were asked a question in a virtual town hall. So, I guess I have to ask my question in public to get an answer. Are Common Core, Next Generation Science Standards, and the Smarter Balanced Assessments a good idea for Michigan? The buck stops with you Governor Snyder. You cannot sit on the fence and appear neutral regarding Common Core. If Michigan plans on requiring students to answer hundreds of questions based on these standards, you should be required to answer one first. A "tough nerd" would not just answer the question but ace it. As the battle regarding Common Core rages on in capital buildings and on the internet, speculation has started about the future of testing and the various entities that control them. Shane Vander Hart at Truth in American Education shined the spotlight on Chester Finn of the Fordham Foundation and Finn's speculation that Smarter Balanced and PARCC may not be around forever. "I expect that PARCC and Smarter Balanced (the two federally subsidized consortia of states that are developing new assessments meant to be aligned with Common Core standards) will fade away, eclipsed and supplanted by long-established yet fleet-footed testing firms that already possess the infrastructure, relationships, and durability that give them huge advantages in the competition for state and district business." But Vander Hart cautions not to get too excited, because Finn thinks they may be sidelined by the traditional testing favorites: ACT and SAT, which are already aligning to Common Core. In fact the ACT admits to being a "partner" in the development of the Common Core. "The Common Core State Standards Initiative is led by the National Governors Association and the Council of Chief State School Officers, in partnership with ACT, the College Board, and Achieve." "The Superbowl of education is set to begin. Whoever wins this match up will get more than a trophy, they will be well positioned to run the coveted national exam. Sadly, the loser in this game isn't just the other testing company, it's the American people. It was obvious to me over 7 years ago, that ACT was working to hard to gain stature and political clout. In 2005, Michigan along with several other states adopted the ACT as its high school exit exam with the accompanying WorkKeys. Alabama just adopted ACT Aspire and it is on the radar in Michigan for the future as well. What is ACT Aspire? "The first digital, longitudinal assessment system to fully connect student performance from elementary grades through high school. ACT Aspire will provide educators and parents with the insights they need to help students get and stay on track by better connecting assessment to teaching and learning." Testing meets tracking at ACT, Inc. When Smarter Balanced and PARCC entered the scene I wondered how ACT would fit into the scheme given they are large component in Michigan's high school exit exam, the MME . The mystery was solved last year when ACT, Inc. partnered with Pearson to launch Next Generation College and Career Readiness Assessments. Coincidentally (or perhaps not) the new science standards bear the name, Next Generation Science Standards. Common Standards require a common test. Now I'm wondering if Smarter Balanced Consortia and PARCC provided the necessary cover to make it appear that these are state-led assessments but the eventual outcome will be a national exam lead by ACT, Inc. or College Board. 3. Let's All Hold Hands. Under this approach, states are encouraged to join together to develop common standards and tests. Washington would provide incentives for such collaboration. One "common" link to the testing component is Pearson, who was awarded a lucrative contract with both Smarter Balanced and PARCC. They also have alliances with both ACT, Inc., and the College Board (SAT, AP, and AccuPlacer). In January David Coleman, President of the College Board, announced a complete redesign of the SAT test. In another interesting twist, earlier this month Cynthia B. Schmeiser came out of retirement after 38 years at ACT, Inc., to take a new position as chief of assessments with College Board. Schmeiser was a driving force behind Common Core while at ACT. The new SAT is said to likely look more like the ACT. But ACT, Inc. does not have a viable competitor to College Boards, Advanced Placement. So perhaps it won't be a clash of the testing titans but a merger? Whether it is ACT, SAT, or SACT, or some other name, it means a common test to go with the common standards. "I’m also concerned about the impact these organizations aligning to the Common Core will have upon private schools and homeschoolers." His concern is well-founded. I've been trying to sound the alarm for years. Homeschool and private schools are will be "voluntold" to align or be at a disadvantage in college and career advancement. Not because we lack the knowledge but we lack the ability to gain the coveted credential a national educational testing and tracking system provides to those that align. In the words of Parchment e-transcripts are "Putting the Train on the Tracks." Only those in the national P-20 educational e-system will get the e-transcript or the "ticket" they need to jump on the train and move toward their final destination in the global e-conomy. If you're new to learning about Common Core and want to get up to speed quickly watch Ben Swann's four minute primer on the Common Core State Standards. And if you're looking for more in depth information. This five part video series will help. If you would like more information on what you can do or how this will affect homeschoolers you can read my posts on the Common Core. Truth in American Education is a great place to learn about what you can do and what is going on in your state. And if you still have questions, feel free to ask in the comments and I'll try and find out. Anytime you have Republicans like Jeb Bush singing the praises of lead architect of the Common Core David Coleman and siding with Democrats, it should cause a rift in the GOP. "Concern from conservatives has reached a boiling point, leading the Republican National Committee last week to adopt a resolution condemning the standards." This has action clearly upset Jeb Bush. The Foundation for Excellence in Education, founded by Mr. Bush and a strong voice in favor of Common Core, is accusing the RNC of having “no real debate on the issue” and caving to fear and paranoia. Clearly, grass roots activism is making making an impact. "More than 100 parent groups and other organizations held a “Twitter rally” this week to galvanize opposition to the standards. Pundits such as Michelle Malkin and Glenn Beck are leading the charge against Common Core, and that effort is spurring action in state capitals." Jeb Bush is doubling down and determined not to let parents decide the standards for their children. Just days after the rally, Jeb Bush wrote a glowing testimony of lead architect of the Common Core, David Coleman. He is the kind of leader who gives me hope for the future. Grassroots activism that puts Jeb Bush and the GOP on the defensive gives me hope for the future, not David Coleman! Keep the pressure up. We're winning. Michigan's bill HB 4276 to prohibit the implementation Common Core has proponents worried because homeschoolers have lawmakers phones "ringing off the hook." Ohio decided not to fund the PARCC assessments associated with Common Core. Many states are also considering the Next Generation Science Standards in the next month. Let your state lawmakers and school boards know you do NOT support their implementation. You can also call your US Senators and ask them to support Senator Grassley's fight against funding Common Core. Every effort makes a difference. As I researched and wrote about education and pending reforms, I began to see that the long-term goal of the Bill and Melinda Gates Foundation and other proponents of education reform in the United States was a global education standard. I also began to realize that the single greatest hindrance to achieving that goal is the decentralized approach to education United States. That's why "common" standards which are in essence a national standard are being pushed so strongly under the guise of being "state-led." Local control is the enemy of global education standards. Consider what Sir Michael Barber, the man responsible for quickly implementing many of the major education reforms under Tony Blair, said in 2006 about the United States. ES: Why has England been able to make so much more progress than the U.S. on education reform? MB: The biggest problem in the U.S. is how you get reform to scale. The U.S. is full of fabulous boutique projects, but in a sea of underperforming systems. In England, because we don't have federal-state separation or the separation of powers between the legislature and the executive, if you've got the design right you can have a big impact. And Labour in 1997 had a big majority, so it demonstrated you could do reform at scale very quickly. By contrast, I've recently been in California, which is almost the same size as England in school population, and was struck by the impossibility of doing anything remotely coherent when you've got a state commissioner of education directly elected, a governor directly elected separately, a legislature with a different set of views, and then some powerful mayors. It's not anyone's fault—there are some brilliant education reformers around the U.S., including in California—but to do anything coherent in a context like that is so much more difficult. The other fundamental flaw that I think is absolutely devastating in the U.S. is that because so much of the school system depends on very local taxation, the distribution of funding is inequitable. You can see how it originates in 19th century American history, but it is a big problem. Local control, unique to the United States, is perceived to be "fundamental flaw" that must be overcome before global education reform can be complete. Just let that sink in for a minute. Sir Michael Barberr is now influential in United States education reform. When made that statement, Barber had already left British government and moved on to a position as head of global education at McKinsey and Company. McKinsey along with Achieve, and funding from Bill and Melinda Gates, conducts studies that validate their goal of global partnerships in education. Here's one such report prepared for Ohio. David Coleman the lead architect of Common Core also worked at McKinsey at about the same time. Coincidence? I don't think so. Sir Micheal Barber has now moved on to become the Chief Education Adviser to Pearson. (See more at CommonCore) Pearson is responsible for much of the online assessments and curricula for the national standards. There is even talk of a Pearson College Degree. See Barber's newest report An Avalanche is Coming for his plans for higher education. Coleman has moved on to become President of the College Board, which is aligning the Advanced Placement and the SAT to the national standards. The assessments are scheduled to be implemented in the 2014/15 school year. Can it be stopped. Yes. Let's turn this around by using the same tactic Sir. Michael Barbour used in England to produce his massive reforms. "I helped organize and lead a boycott of the national test in 1993, not because I was against testing in principle, but because the controversial policy had been so poorly implemented." Parents and teachers in the United States must boycott the national tests being developed by Pearson and through Smarter Balanced and PARCC because the controversial policy is contrary to the fundamental principles of our Constitution and local control of educaiton. He believes citizens need to act boldly and unapologetically to make it happen. I agree but not to achieve his goal of global education but to demonstrate the power of local control and grass roots activism. Let's act boldly and boycott common core and national assessments and create an avalanche against global education standards. Sir Micheal Barber and his comrades won't know what hit them. Hopefully, they'll finally understand that this "fundamental flaw" is a fundamental principle of the United States of America -- the land of the free and the home of the brave. And make no mistake about it, global education standards will also affect homeschoolers. See my recent article in The Old Schoolhouse Magazine available online here. You can work the key members of your state and work to pass bills that prohibit implementation. HB 4276 is one such bill in Michigan. Call your representatives and senators and find out the names of the bills in your state. If there isn't one, ask them to sponsor a bill to stop Common Core. The National Republican Committee came out with a resolution to Stop Common Core. You can forward that to eduction committee members and your legislators to help persuade them. There are also Facebook and Twitter rallies that you can be a part of to learn more and voice your objections. On Twitter, @ParentLedReform is hosting a Twitter rally tomorrow, April 16. Parents and Educators Against the Common Core is on Facebook and full of information. Truth in American Education has loads of information and a map to what specific states are doing to halt Common Core. Michelle Malkin is active on Twitter and links to many informed sources. If you homeschool, you can also choose your curriculum wisely, letting publishers know that you do not want materials that are deliberately aligning to the national standards. Educational Freedom Coalition has files to learn more. Support publishers who understand that their liberty and livelihood is at stake if a national curriculum are developed and written to the standards. As powerful and well funded as this monster is, it is at the same time, ironically, very delicate. Locally, it only takes a few determined people with staying power to temporarily grind these engines to a halt, sending reverberations of dissonance into every level of the system. Think only of the multi-billion dollar standardized testing aspect of the thing; with relatively little investment of time or money a well-orchestrated campaign to sabotage these instruments could be launched and prosecuted over the Internet. You need only think back to the mass of teenagers who brought the war in Vietnam to a premature conclusion, to see that an essential lynchpin of the fourth purpose system -testing -could quickly be destroyed. The fallout from such a termination would rock systematic schooling with unpredictable results for the stability of the institution. Courage - that is what is needed by all parents no matter how or where they educate their children. Do you remember Tiananmen Square of 1989? 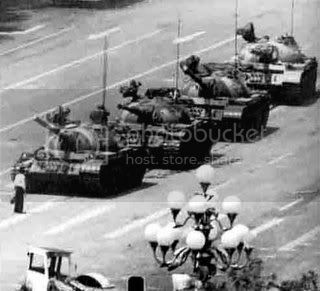 The bravery of one Chinese citizen to stand before the column of tanks halted their progress and inspired the world. We must exhibit the same courage to stand up to the federal takeover of education and centralized control of our child's future. We will direct our children's education not an army of educrats in the government and their battery of tests. Parents don't have to homeschool to halt the reforms. (But it helps!). They just have to be willing to say "no" to the test just like this young man stood before the tank. I have yet to meet one parent in our area, homeschooling or not, who likes the time and emphasis spent on the exams. Testing is a key component and very profitable part of the reforms. We need a Reagan moment in education, "Parent tear up that test." Pilots for the Smarter Balanced and PARCC assessments are already in piloted in many states. Michigan hopes to replace its high school exit exam with the new assessments in 2015. The tests are the oil that drives the engine of these reforms and the P-20 database tracking and data mining. What will the history books record about this generation? Will they see images of parents standing in front of the tests or standing on the sidewalks as the school bus rolls on by? You are either protesting or pro-testing. The choice is up to you. A teacher summed it up this way, "We don’t expect our doctors to turn over our test results to the state, why should teachers give children’s data to anyone but them and their parent or guardian?" Update: Parent and radio host, Rick Smith, finally said, "Enough!" and pulled his daughter out of the PSSA given in Pennsylvania. Much is being written all over the internet regarding Common Core State Standards, the new Next Generation Science Standards, and whether they will impact homeschool students. For years, I said the looming education reforms will impact homeschoolers, in college admission and employment. Some of my conservative allies and friends laughed at me, or said I was a conspiracy theorist and sucker, for suggesting such foolishness. I was secretly hoping they were right and I was wrong but I didn't want to take that chance. I kept trying to connect dots and inform homeschool parents about the problems with national standards. It's now 2013 and the dots are finally being connected by those that promote national standards. Proponents are no longer bashful about what Common Core, Next Generation Science Standards, and the related assessments are really all about - controlling thought and rewarding students whose political and religious beliefs align with the secular orthodoxy. "Students who are educated in accordance with them will have a better chance for success in college courses and in competition on the employment market than those steeped in creationism design, new earth theory, and other alternative accounts." How much more clear can it be that this is about conformity of thought and not high academic standards. Homeschool students and private students who are "steeped in Creationism" don't have a chance because the adaptive tests will filter them out and penalize them for daring to believe God exists. And if you think secular homeschoolers are safe. Not a chance. They want your children in the system. "It is time that we view our educational system which runs from pre-natal to life long learning. It is time to start talking about P-20 instead of just K-12"
Parents who believe that they have the freedom to educate children outside the accountability of the state will also face consequences for not participating, whether they are Christian or atheist. National education standards are the enemy of parent-led education. Period. Building on the Common Core math and English/Language Arts standards adopted by 46 states, Next Generation Science Standards (NGSS) were released today. The website boasts that they are "For states, By state" but like the Common Core math and English Language Arts Standards, the public doesn't own them. The Next Generation Science Standards have trademark and copyright restrictions. The process was completed behind the scenes and a collaborative effort managed by Achieve, Inc. To date, 26 states have agreed to consider the standards. The NGSS Writing Team Leader is Michael Wysession, Ph.D. He is also a writer of the new Pearson science textbooks. Pearson already has "next generation" science textbooks written to accommodate the new standards despite the fact that public commentary on the standards ended in January of 2013. Pearson is proud to present Interactive Science, a next generation K-8 science program, featuring an innovative write-in student edition that makes learning personal, relevant, and engaging. Pearson also happens to have it all packaged together neat and tidy for you to understand on their PearsonSchool: Next Generation Science Standards website. That's quick work! And when it comes time to test, Pearson has "next generation" assessments too. Assessments are no longer just fill in-the-bubble testing they were when we started doing them almost 60 years ago, but the goal remains the same, equal access to quality public education for all children. I think there was a typo in that last quote. It should be equal access to "Pearson" education for all children. The Next Generation Science Standards they appear more to be "By Pearson, For Profit" than "By States, For States." Pearson is positioning itself to be a leader in curriculum and assessments as standards move forward. Pearson was awarded contracts by Smarter Balanced Assessments and PARCC to develop the online assessments in 2012. Pearson's Chief Education Adviser, Sir Michael Barber, is an advocate of global education. He believes local control is a fundamental flaw in our educational system. They are actively marketing to homeschoolers through PearsonHomeschool and currently do NOT demonstrate any alignment to Common Core or NGSS despite their obvious investment and interest in the standards. That's intentional and deceptively attracts independent-minded homeschool parents who do not want to align with the Common Core. A representative in a private email told me that Pearson Homeschool is not aligned "for now." They own Connections Academy which is a "free" aligned and used by many states. Whether aligned or not, the standards and related curricula WILL affect homeschoolers. "Students who are educated in accordance with them will have a far better chance for success in college courses and in competition on the employment market than those steeped in creationism design, new earth theory, and alternative accounts." The Educational Freedom Coalition has a complete listing of homeschool curricula and who is and isn't aligned to the Common Core. UPDATE: Michigan Department of Education is asking for public commentary. The standards will be decided by the State School Board. The board is an elected office. Call and let them know you say NO to NGSS for Michigan. Will Estrada, Director of Federal Relations at HSLDA has an article discussing the data tracking aspect of Common Core. National Databases: Collecting Student-Specific Data is unnecessary and Orwellian. The 2009 federal stimulus bill created the State Fiscal Stabilization Fund (SFSF) program as “a new one-time appropriation of $53.6 billion.”1 With this money, the Department of Education would award states money in exchange for a commitment to develop and use pre-kindergarten through post-secondary and career data systems, among other criteria. A national database of student-specific data is very concerning for many reasons. The national databases being created now include detailed records of students, including race, gender, birth information, learning disabilities, detailed academic records, and much more. This information is being collected soon after birth, all the way through graduation from college.The more personal information that is included, the greater the danger to the student’s privacy and safety if the data is breached. Will certain data make it harder for students to get into higher education? Will it be disclosed to government employers, or even private employers?HSLDA believes that each student is unique, with far more to offer society than just the sum of their academic years. Government tracking students from soon after birth until they graduate from college is Orwellian and seems like a “Big Brother” mentality, and has no place in a free society.It is important to note that there are many reasons for aggregated student data to be available. Such data is helpful for researchers, and it is reported widely so that parents and policy makers can determine how students are doing academically. But HSLDA believes that there are very little reasons for the government to track student-specific data. National Databases and student tracking are not new to President Obama. It's been in the work since President Bush and in the blueprint for years before that. National standards, testing and tracking is the primary reason I started my blog. DALLAS, Nov. 10, 1999 — The Software & Information Industry Association (SIIA) and Microsoft Corp. today announced the developers release of the first working specification for the Schools Interoperability Framework (SIF), a new technical blueprint for ensuring that software applications in K-12 schools can share information seamlessly. The release marks the beginning of a public review period for the specification, the release of SIF deployment guidelines and the successful completion of pilot programs in two U.S. school districts. "We propose to dramatically expand college participation and success by outlining ways in which post secondary institutions, K-12 school systems, and state policy makers can work together to create a seamless pathway, between high school and college. States K-12 graduation standards must be closely aligned with college and employer expectations." "We must do more to help students achieve academic success," Snyder said. "We’ve been spending money without delivering the results to give our young people a bright future. It is time that we view our educational system which runs from pre-natal to lifelong learning. It’s time to start talking about P-20 instead of just K-12. We need to establish a system that focuses on real achievement for all of our children. The privacy issue is definitely a concern for students IN the database. Promoters of the database see the good that can come from data collection. Adaptive learning through data tracking can reportedly help students overcome struggles in various subject areas. Just think of the grocery store scanners and how much info they get on our purchases. They have the ability to generate personal coupons based on what I just purchased. This is similar. But to do so, data must shared with corporations to develop the tools. The breach of privacy has parents in New York fuming. It should all parents fuming. Thanks to national education reform and the adopting of Common Core it's coming to every state that signed on. State education policy makers are working to make sure every child is in the system. Michigan recently attempted to get homeschooled students to register with our local school district. Virtual charters are another avenue to bring home schooled students in the system as well. Remember, under Bush this was called No Child Left Behind and they meant it. This is where homeschooled and private schooled who do not complete coursework not aligned with Common Core and are not "tracked" could potentially encounter problems. Six students in a private Christian school were denied admission into college because some of their coursework (A Beka and Bob Jones) was not acceptable by the University of California system. They lost their court battle. Along with course work, high school "exit" exams are part of the seamless "P-20" pathway. But accessing the exams will be difficult once the new "national exam is complete. Two state consortia, Smarter Balanced and PARCC, are developing those tests. They are scheduled to be implemented in 2014/15. Test dates are likely to be standardized around the country. Homeschooled students wont' be "forced" to take the exam and continue to operate outside the system. But NOT taking the exam will put a student at a disadvantage in college and career advancement. Taking the exam, will give the government an avenue and the data they need to track our children. National standards + National tests + National curricula + National tracking = P - 20 seamless educational system. To understand Common Core State Standards and their guiding philosophy, I'd like to introduce you to David Coleman. David Coleman, is the "lead architect" of Common Core State Standards. Coleman also began the non-profit Student Achievement Partners and developed the site AchieveTheCore to "guide" publishers in ways to shift their materials to meet the new standards. Coleman also took on the position as the head of SAT. So we have the same person spearheading up standards, curriculum, and test. With an $18 Million grant from GE Foundation, Coleman is well-funded and ready to transform our educational system to create workers for a global economy. Learn who David Coleman is and you'll understand a lot about the Common Core. Sorry for the language. But those were his words and it guides the Common Core which places a greater emphasis on "informational texts" for utilitarian purposes rather than fiction or writing personal narratives for that matter.
" David Coleman’s ideas are not just another wonkish trend. They have been adopted by almost every state, and over the next few years, they will substantively change what goes on in many American classrooms. Soon, as Coleman steps into his new position as the head of the College Board, they may also affect who applies to college and how applicants are evaluated. David Coleman’s ideas, for better or worse, are transforming American education as we know it. "If you put something on an assessment in my view you are ethically obligated to take responsibility that kids will practice it 100 times." What is tested is what is taught. What is taught, is what is thought. Why parents and publishers are blindly giving up so much to one man's philosophy of education is mind boggling. Just mind boggling. Education policy expert, Diana Ravitch has spoken against the Common Core and asks the question that should be on the mind of every parent in America, "Is there not something unseemly about placing the fate and the future of American education in the hands of one man?"